Is Nitrogen Narcosis Dangerous? Let's Get Narced And Find Out! As a dive instructor I love to experience narcosis. Seeing other divers affected by narcosis is pure joy. This state is referred to as “being narced”. Sometimes people are afraid of it. Adrenaline junkies seek it out. As a result there are many questions surrounding this phenomena. 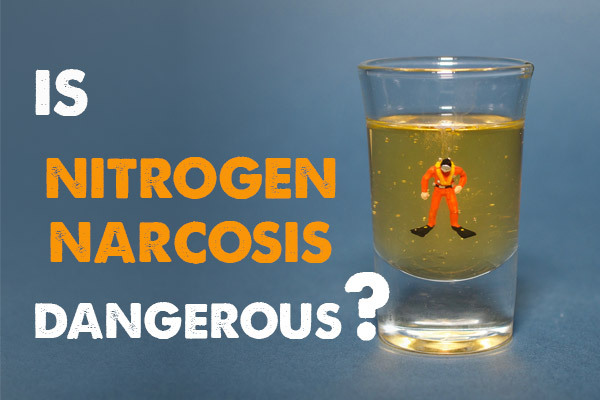 In particular, is nitrogen narcosis dangerous? What is Nitrogen narcosis? What are the symptoms? And, can you avoid it all together? I particularly remember one of my divers sitting in the silt and signalling “Ok!”. I signalled that we should swim back towards the reef and he seemed to ignore me. Later when I referred to the incident, he couldn’t remember our interaction and we laughed about it! There are countless nitrogen narcosis stories. Divers being in absolute hysterics. People that experienced a numbing of their mind. Some report that they do not remember certain parts of a dive. This all sounds a little scary. Considering this, is nitrogen narcosis dangerous? Nitrogen narcosis is the effect nitrogen has on the human brain when consumed under higher partial pressure. For instance a person does not experience nitrogen narcosis breathing normal air on the surface. However a diver will breathe a higher partial pressure of nitrogen when descending deeper. In fact this effect is not attributed to nitrogen alone, but may occur with gases of a certain lipid solubility. Therefore all breathable gases at a certain partial pressure will have a narcotic effect of some degree. Helium and neon are breathing gases with less narcotic effect. This is especially true due to their limited partial pressures a diver can currently expose themselves to. With regards to this, some argue that it is more accurate to refer to this effect as gas narcosis. Since we only breathe oxygen and nitrogen in recreational scuba diving, we can correctly refer to it as nitrogen narcosis. In 1953, Jacques-Yves Cousteau exposed himself to greater depths, experiencing more intense nitrogen narcosis. He famously referred to this as the “raptures of the deep,” describing it as an urge to want to dive even deeper. Hence why divers like to compare it to alcohol. One or two drinks do not alter one’s behaviour. However after several drinks the urge to consume more increases in intensity. The beauty of nitrogen narcosis is that there is no hangover and we can alleviate the effect by ascending slightly. Sometimes it is hard to remember exactly what fish you saw on the dive. I often conduct a narcosis test with divers that reach 30 meters for the first time. A simple rational or mathematical task can prove far more difficult at depth as opposed to the surface. Checking multiple gauges, taking photos and watching out for your buddy can require more conscious thought when narced. So, What Is The “Nitrogen Narcosis Depth”? As a matter of fact, gas narcosis is often referred to as the Martini effect. The effect one feels when consuming one or many Martinis. Particularly every 10 meters is one Martini. In consequence the greater the depth the greater the effects of nitrogen narcosis. You can comfortably hop on one leg after one Martini, similarly you can confidently check your pressure gauge at 10 meters. It is commonly agreed that nitrogen narcosis in most adults is still easily manageable at 30 meters. Conversely everyone reacts differently. I have experienced narced divers as shallow as 25 meters with noticeable symptoms. In summary, there is no particular depth. The greater the depth the greater the effects of narcosis depending on the gas the diver is breathing. So if it impairs our thinking, doesn’t that mean it is dangerous? Simple answer is no. Nitrogen narcosis needs to be acknowledged and managed. Keep It Simple. Having a simple dive plan does wonders. Try not to task load. Reaching one point of interest as opposed to seven. Experience Helps. It is not believed that divers can build a physical tolerance to nitrogen narcosis. However divers can learn to think more clearly despite the effects of narcosis. As diving tasks become routine, it is easier to perform those tasks under increased difficulty. Communicate Effectively. Take a slate so you can clearly communicate with your buddy. The Right Mindset. Make a solid dive plan. Stay hydrated. Don’t be afraid of narcosis. Being in the right mental space, has proven to decrease the effects of gas narcosis. Be Comfortable. Anxiety about equipment and conditions can increase the effects of narcosis. Make sure you are comfortable, warm and relaxed. Avoid medication and overexertion on your dives. Relax And Ascend. If you feel uncomfortable on a dive signal your buddy. Together you can ascend slowly for a few meters. Narcosis is “cured” instantly by decreasing partial pressure, in other words ascending. Shall We Have One More Then? I think so. Is nitrogen narcosis dangerous? I don’t think so. There are no inherit dangers in getting narced on a dive. Don’t push your limits. Follow the simple safe diving practices that you have learnt. This way you can enjoy a bit of narcosis. Remember there is no hangover! If you feel uncomfortable you simply need to ascend a little. This will alleviate the effects almost instantly. That way you have a good story to tell at the bar! Ever been narced? Got a funny story? Share it with us in the comments below.